So you want to improve your net game but you’re not sure exactly what to do. 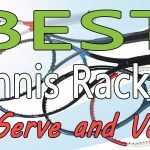 In this post we’re going to give you the absolute best serve and volley drills you can do. These are drills I’ve used to improve my game as well as that of my students. Listed by name, they are Ghost Doubles, the Volley-To-Volley drill, the Three-Volley drill, the Mad-Volley drill, Volley-Overhead Alternates, the Catch-And-Volley, the Half-Court Volley game, Hit the Target and the Service Line Touch. Now keep in mind that I made up the names to some of these drills, so you may have never heard them before. We’re going to review each one and by the end of this post, you’ll know how to do all of them. Every drill here is helpful, but you’ll probably narrow it down to a couple of favorites when you practice. I particularly like the half-court volley game. This drill really sharpens my reflexes and simulates a point at the net very well (more on it to come). Keep in mind that we made a video of all these drills so you can see them played out. It helps to read about them as well, which is the reason for this post. Watch the video and read this post for the best overview of each drill/game. Our blog posts go into more detail than our videos do. You may be wondering how advanced you need to be to do these drills. If you have basic volley technique and can serve, these drills are within reach of any level player. Even children can use these drills to improve their game. I often use them with my younger students, as most are great fun. 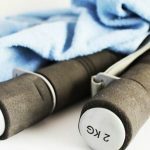 You can incorporate these drills in a full practice session or do a couple before or after a match. Without further talk, let’s get into it. I first learned ghost doubles from my tennis coach in college. We used it quite a lot in our practices. It’s a great drill for doubles but can also hone your singles play. This drill requires two people – one will be serving and the other will be returning. There are two rules to the game that make it different from a regular tennis match. First, the server has to serve and volley. He or she must keep pressing into the net or else lose the point. The only time the server is allowed to back up is to field a lob. After the lob is hit, the server must move in again. The other rule is that only half the court is used. If you are serving from the deuce side, only the deuce side is in play for both players. Any ball hit into the ad court is automatically out. The doubles allies are in play in this drill, so anything hit into the doubles alley counts. 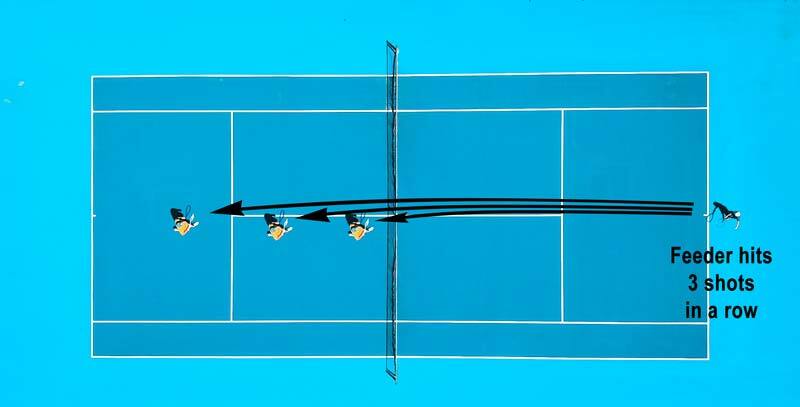 After the point is over, alternate to the the ad side (just like in a normal tennis match) and the same rules apply in reverse – any ball hit into the deuce side is considered out. Keep playing points until the game is over. You can play up to a certain amount, like 10 points, or just play a full set. 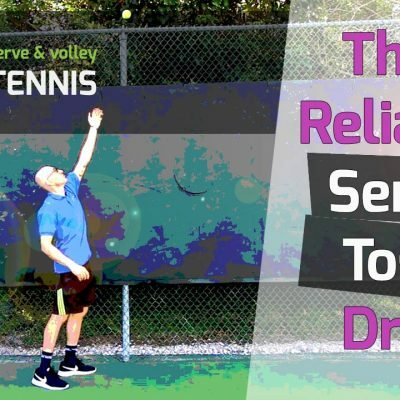 This drill realistically simulates doubles play and is great for improving your serve and volley doubles game. It also helps the returner develop good passing shots. This drill is one of the best for improving your volley game. It should be used in every practice and will definitely sharpen your reflexes if used consistently. Two people are required for this drill. Each person will stand at the service line – one on each side of the net. I like to set up in the middle of the court to afford plenty of space to the left and right of me. Start by hitting the ball to your partner. Ideally, your partner will volley the ball in the air and hit it right to you. You will then volley it back (out of the air) and hit it back to your partner. This will continue until one of you miss. When that occurs, just start again. You want to hit the ball at each other so you can practice your volleys. Don’t try to be a hero and see if you can win the point by hitting away. That’s not the point of this drill. 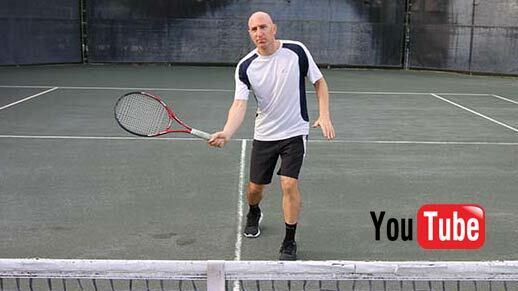 It’s perfectly fine to hit half volleys too, as sometimes the ball will not reach you. 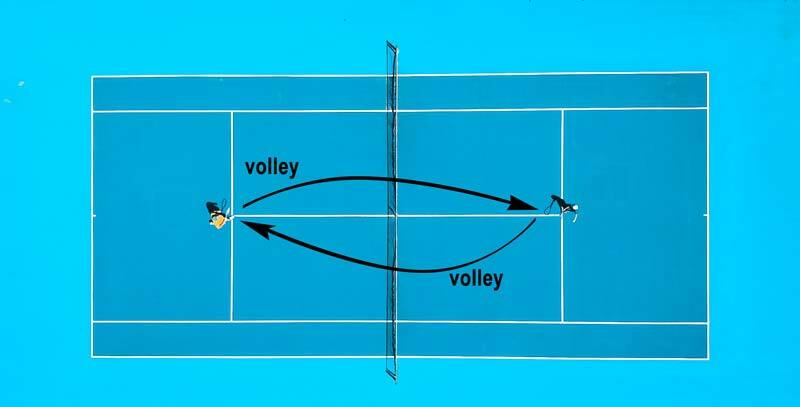 You can move in a bit to volley, but if you go too far past the service line, the drill will become very difficult for both of you, as the ball will be going too fast. When you first learn this drill, it may be difficult to get more than several volleys back. Hit slow to each other at first and use a continental grip. Return to the ready position as soon as possible after each volley. In time, you will get better and better. With consistent practice, it won’t be long before you will be able to hit many volleys before you miss. Keep in mind, this is not a game but a drill. The idea is not to blast the ball past your partner but to keep the ball in play for as long as possible. 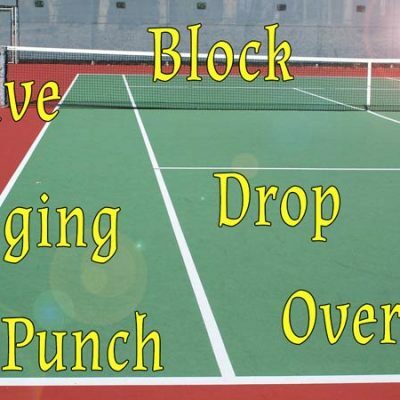 This is more of an advanced volley drill that is great for the serve and volley. Only one player will be doing the drill, but another person is needed to feed the balls. For the player doing the drill, start about three feet in back of the service line. The player on the other side of the net feeds you three quick volleys. The first volley is taken from the starting point. 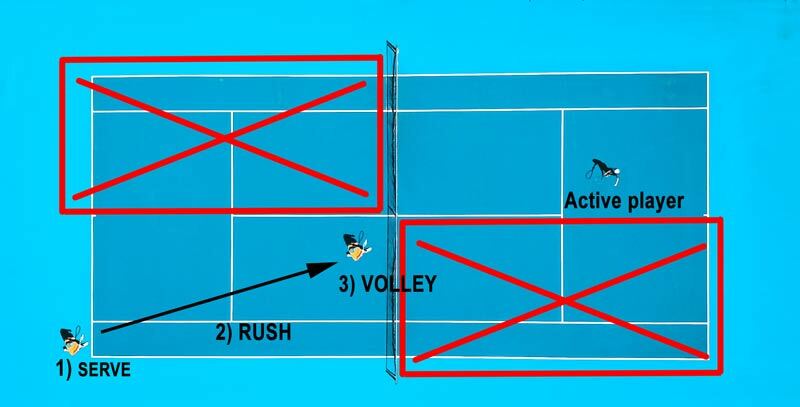 Once you hit the first volley you quickly move in, hit another volley, move in again and then hit your final volley. By the time you hit your third and last volley, you should be within 5-6 feet of the net, if not closer. The person feeding the ball is advised to feed one after another with no delay. For beginners, feed slowly and hit higher shots that are easy to volley. If a player is more advanced, feed faster and lower shots to make the volley more challenging. The person feeding can hit all three volleys to the forehand, all three to the backhand or make them random. Once all three balls are volleyed, the player returns to the spot three feet in back of the service line and goes through the drill again. As an option, after the three volleys are made, the feeder can hit a lob for an overhead smash. This drill can make you tired if done quickly but it’s a fantastic one to work on your volleys as you move in. The split-step is advised for this drill. However, advanced players can forgo it in favor of a flowing volley. When performing this drill quickly, your mechanics can get sloppy, so videoing yourself to monitor your progress is a good idea. This drill is one of my favorites to do with my students. I don’t use it much in my own practice, but I find it works great with beginners to really challenge them. Children especially love this drill. This drill is performed by one player and requires another person to do the feeding. The player performing the drill will stand about 2-4 feet from the net, depending on their height. Shorter people can move closer, taller people can move back a bit. For the feeder, it’s best to have a hopper with at least 50-75 balls for this drill, as they will be used quickly. For an enhanced effect, play uplifting music on your portable speakers or phone. I do this with the children sometimes and they go crazy for it. 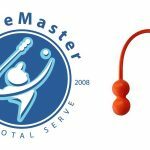 The person feeding the balls will be positioned around mid-way between the service line and the baseline. 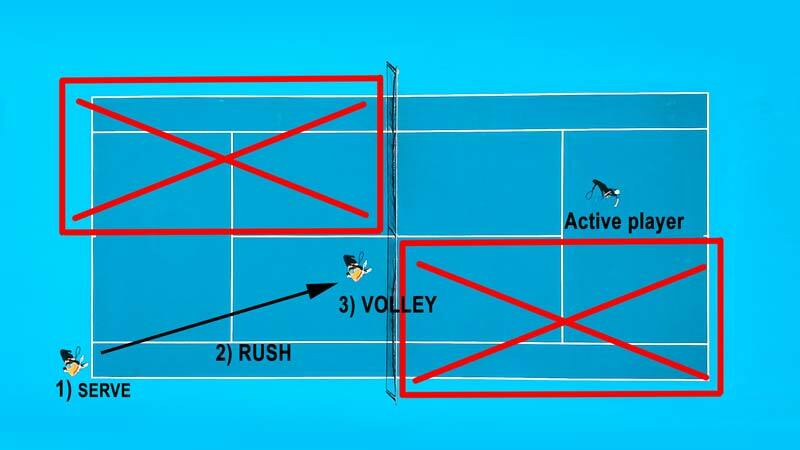 The feeder should hit random shots to the player volleying at the net, one after another until all the balls are gone. I suggest varying the shots. Hit some fast, some slow, some high, to the left, to the right and even right at the volleyer. The player at the net gets inundated with shots they have to volley, one after the other for about a minute straight. This is a great drill to sharpen the reflexes and make the player hit a ton of volleys in a very short period of time. It can work wonders for anyone’s volley game. Try it out for yourself. This drill is simple and straightforward, but very effective for improving the overhead. One player performs the drill – although two players can do it too. One person is needed to feed the balls from the other side of the court. The person feeding will stand between the service line and baseline on one side of the court. On the other side, the player or players performing the drill will start about half-way between the net and service line. If one player will be doing the drill, he or she can stand in the middle of the court. If two players do the drill, have one stand on the ad court and the other on the deuce court. 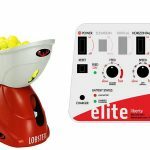 The feeder will start by hitting a shot that has to be volleyed. If the overhead forces the player in back of the service line, he or she needs to move in towards the net again for the next volley. This drill requires good coordination and will improve the overhead smash. If two players are performing the drill, you can make it a game by keeping score. Simply alternate giving a volley and overhead to the player on the deuce court and then a volley and overhead to the player on the ad court and keep repeating. A volley that goes over the net is worth one point and an overhead smash is worth two. Play up to 11 or 15 points. The catch-and-volley drill is ideal for intermediate level players and those looking to add touch to their volleys. We’re often taught to “punch” the volley, which does not involve a lot of touch. The catch-and-volley drill requires very soft hands by “catching” the ball on our racquet. This helps us to learn feel on the volley. Children can and should be encouraged to perform this drill as well. Basic volley technique is needed to perform this drill, and it may be difficult for beginners at first. 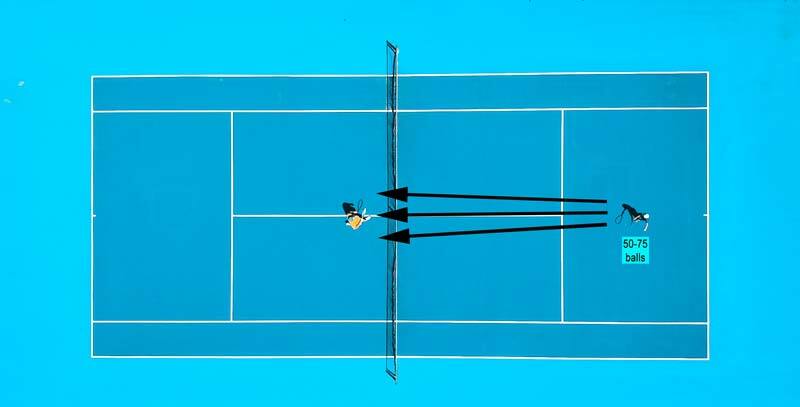 It involves two players, one on each side of the net, both standing near the service line. This is really the same drill as the volley-to-volley drill with a couple of exceptions. 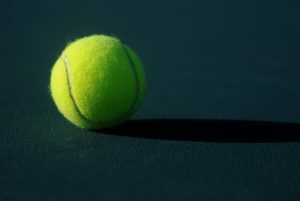 First, both players must “catch” the ball on their racquets. 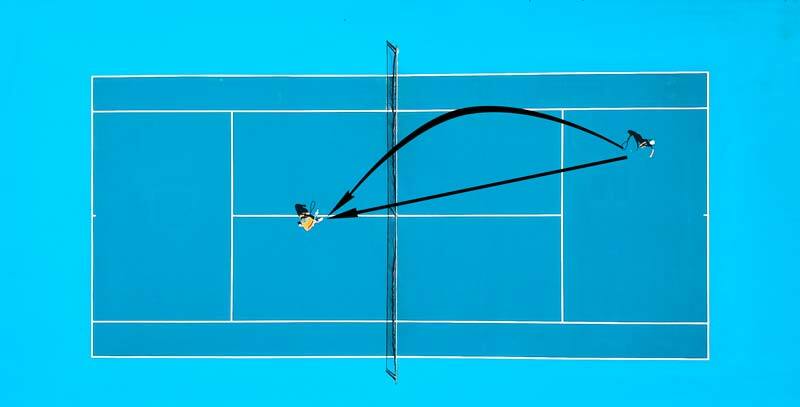 This is done by getting the racquet under the incoming volley causing it to bounce straight up from their racquet. While the ball is in mid-air, the player will hit a volley to the other player across the net. The player across the net will do the same. 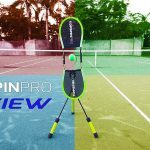 They’ll slow the ball by volleying with the racquet under the ball in a slice position (racquet face open) and this will cause the ball to move directly upwards. 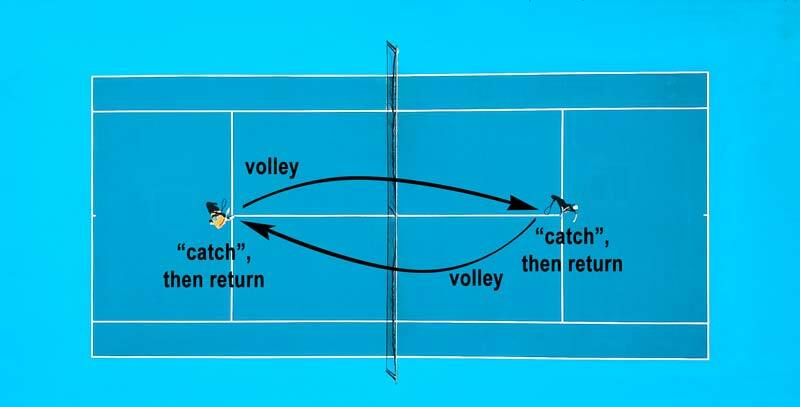 Once in mid-air, the player will volley the ball back across the net and the point continues. This is a complicated drill to explain in words, so if it’s not clear to you, please watch our accompanying video. This is a great drill for improving your drop volley. You can increase the level of difficulty by adding a variation. If you “catch” the ball on your backhand side, try using a forehand volley to hit across the net. Do the inverse for catching on the forehand side. This requires great dexterity and requires fast reaction times. One additional note – if you receive a half volley, treat it like a regular volley and bounce it up off your racquet and then proceed to volley as usual. This drill can take a few times to learn for a beginner. Keep at it and make this drill a part of your practice sessions. This is one of my favorite volley drills and I like to use it in warmups instead of mini tennis. It requires two players. The players will be on opposite sides of the net, positioned at the service line. In this game, only one half of the court will be used. You can choose to play on the left side of the court or the right side – it really doesn’t matter. You can switch sides (left to right or right to left) after the game is over if you choose. For the duration of the point and game, you need to stay around the service line. A point is won or lost the same as in a real tennis match with the exception that it is out if hit on the opposite side of the court. For example, if you play on the left side of the court, everything hit to the left of the center line is good. Any shot that lands to the right of the centerline is out. The doubles alley is considered out. Player one starts out by hitting a shot to player two. Once player two volleys back, the point is live. You can hit groundstrokes, swinging volleys, half volleys, drop volleys and overheads if you can. Just don’t kill your partner! If you want to keep it cordial, just stick to punch volleys and half volleys. I play up to 11 points and play 2-3 games in warmup. This is an interesting and challenging game that makes warm-up fun. The harder you can volley and keep the ball in play, the better you’ll do. Try it out and add it your practice sessions as well. This drill involves one player hitting three different targeted areas on the court. To delineate the areas, use cones. If you don’t have cones, tennis cans are good substitutes. Place three cones on the baseline 12 feet apart. The player doing the drill will stand on the other side of the net, near the middle of the court and about 3-6 feet from the net. The use of a hopper is a good idea with this drill. The person feeding the balls will hit a forehand to the player volleying at the net. Before feeding the ball, the feeder will call out “left, right, or middle”. You can also say, “one, two or three,” to differentiate the three zones. 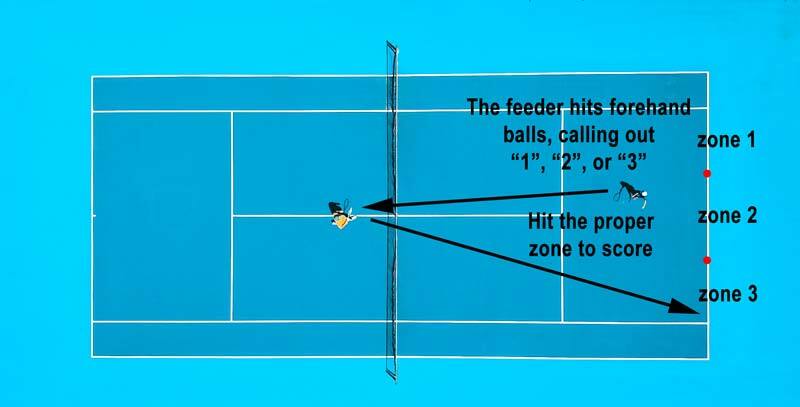 After the forehand is hit by the feeder, the volleyer must try to hit the targeted area called out by the feeder. 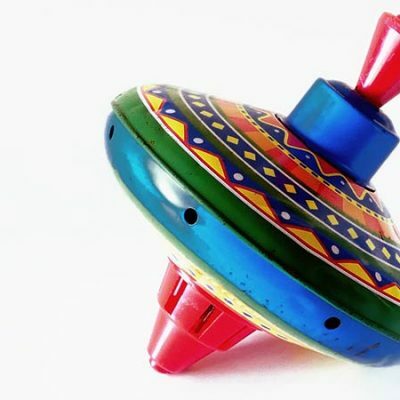 The feeder can vary the speed of the shot depending on the skill level of the player. Overheads can be thrown into the mix in the same way, with the feeder calling out the zone to aim for. Each time the player hits the right zone, they get a point. I usually feed 20 balls to the net player and count the points. If you use this drill with the same person often, you can record their scores to come up with an average and personal best. In the next practice session, they can aim to beat it. I can’t let you go without a bonus drill. This one involves two players. In this drill one player stands at the service line, around the middle of the court. This player will only hit volleys. 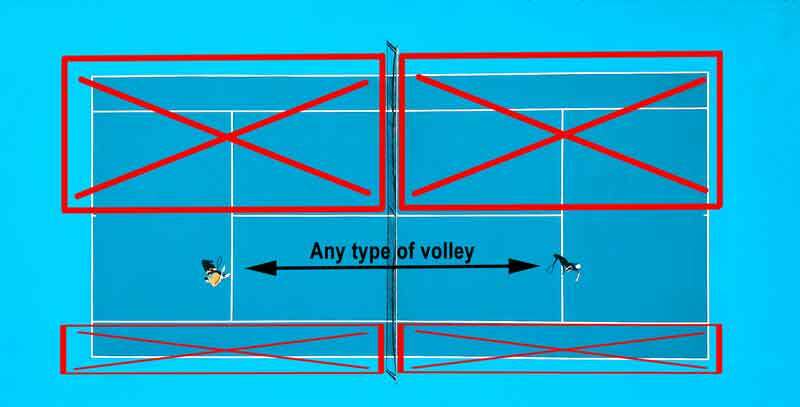 The other player stands on the opposite side of the net, also around the service line and middle of the court. But this player can only hit groundstrokes. The key to this drill is for the volley player to use touch to control the ball. If touch is not used it will be difficult to control the ball. 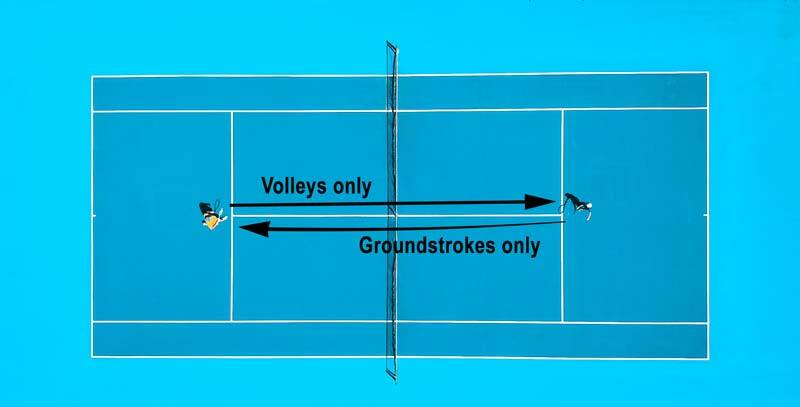 For example, if touch is not used, the ball will fly off the volleyer’s racquet and not allow the player on the other side of the net to hit a groundstroke back. This drill works when there is a continuous flow of groundstroke and volley, groundstroke and volley, etc. This is another favorite drill of mine for learning to have soft hands at the net. There you have it. 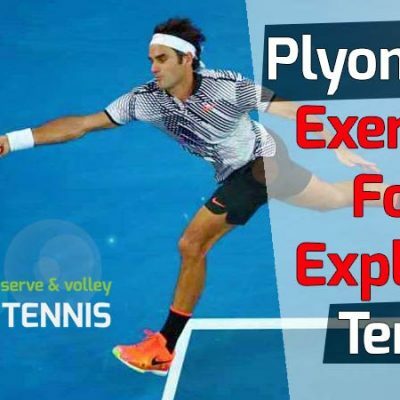 Nine awesome drills you can use to improve your serve and volley skills while having fun doing it. Use them with your children or employ them with your hitting partners. 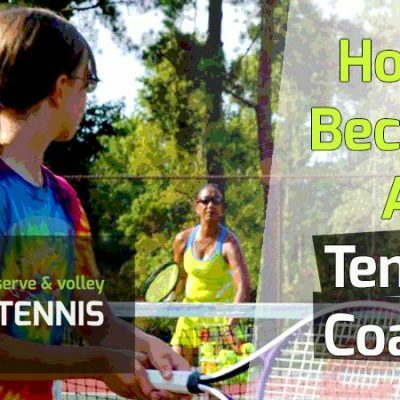 Tennis coaches can also use these drills with their clients to achieve definite improvement over time. You can watch our youtube videos for visual demonstrations of all the drills. Until the next post, have fun, practice hard and keep coming to net!